There is a strong sense of the baroque running through the films of Paolo Sorrentino, not least his bravura portrait of former Italian Prime Minister Andreotti in Il Divo. His first English language venture This Must Be The Place neither dilutes nor abandons that impulse as he creates a weird but sometimes wonderful mixture of road movie and revenge drama. 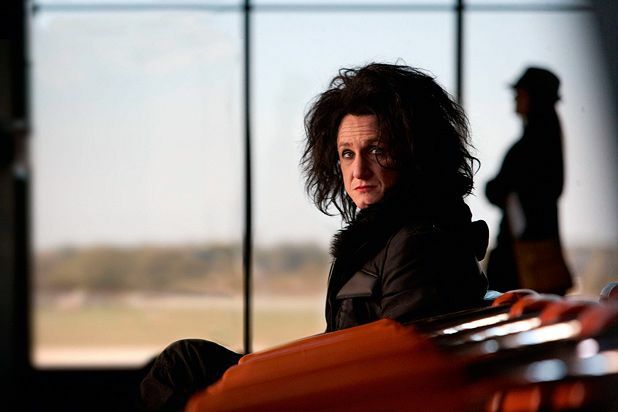 Sean Penn contributes one of his most fearless, idiosyncratic performances as Cheyenne, a reclusive, oddball rock star with the look of Robert Smith, the voice of Andy Warhol and a manner somewhere between Peter Sellers’ character in Being There (1979) and an alien visitor. It is an incredibly endearing, knife edge performance that also has the potential to irritate. How you respond to Penn might well determine how willing you are to embrace the film. There seems little promise in the initial Dublin scenes where the reclusive Cheyenne shares a mansion with his wife Jane (Frances McDormand). The narrative only gains focus and momentum with the news that Cheyenne’s long estranged father is dying. It is then that Cheyenne discovers his father was obsessed with finding one Aloise Lange, the SS officer who humiliated him at Auschwitz. Cheyenne decides to continue the search through the American heartland and there are echoes of Paris, Texas (underlined by a cameo from Harry Dean Stanton) and even The Outlaw Josey Wales as the quest for revenge is transformed into something more complex and life-affirming. Sorrentino displays a wonderful eye for location, colour and composition and wraps the film in a great score from David Byrne. It might not all work, it might risk absurdity at times but there is a bracing aesthetic and gentle humanity to This Must Be The Place that encourages you to overlook the flaws and embrace the ambition of it. General release from Fri 6 April. Reclusive rock star Cheyenne (Penn) goes in search of the SS officer who humiliated his father at Auschwitz. A weird and sometimes wonderful mixture of road movie and revenge drama from the director of Il Divo, with a fearlessly idiosyncratic but endearing performance from Penn, superb visuals and a great score.